This authoritative guide to aromatic plants contains 193 entries on the most important plants for health and healing. 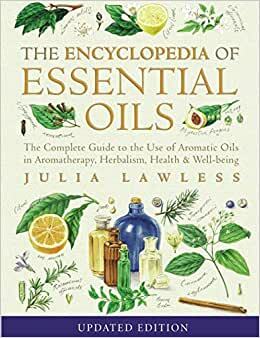 "at last a clear and systematic distillation of useful information about a truly comprehensive spectrum of essential oils and absolutes." John Steele, American Aromatherapy Association. "A comprehensive and timely contribution to aromatherapy, herbalism and the whole field of holistic health care. An authoritative, reliable guide that will serve its readers for many years." David Hoffmann, the American Herbalists Guild & California School of Herbal Studies. This is an excellent book and I highly recommend it! If you're just starting out with essential oils I recommend this book. This book talks about some of the most common essential oils and also some of the most complex essential oils. She also lists all the safety information for each essential oil as well which is a huge Plus!! She talks about the origin of each essential oil, the plant parts that are used, dilutions and what other essential oils might mix well with others essential oils. Everything about this book is exceptional!! There's also some history on essential oils. 3.0 颗星，最多 5 颗星Lots of oils, not much therapeutic info. Lists many, many essential oils with lots of technical info and some nice sketches, but lacks much info on aromatherapy usage. When it gets past chemical makeup and history of the plant, the information is very sparse. Was very disappointed as the book looked great when I first got it, but on trying to use it kept finding myself having to go to other resources to get more therapeutic info on the oils. This was another book I decided to purchase because it was recommended by Mountain Rose Herbs. I believe this is a must-have for anyone who buys essential oils. It really is so important to know about how to purchase good quality oils, the safety of handling this oils, and how they can and should be utilized. This book is the perfect tool for providing you with the information to do just that.